Road works valued at over 23 million dollars are currently underway in the Roseau Valley. 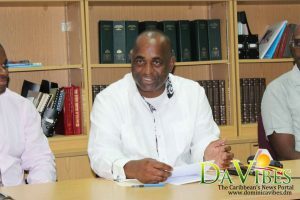 That’s according to Prime Minister of Dominica Roosevelt Skerrit who was speaking at a contract signing for drainage works in Morne Prosper on Wednesday. Mr. Skerrit stated that the 23 million dollars is concentrated solely on roadworks in the different villages. “The Government has signed with work ongoing in the Roseau Valley Constituency alone-contracts totaling over twenty three million dollars just for road works. It is twenty three million dollars just for roads,” Mr. Skerrit stated. Mr. Skerrit went on to explain what the funds are currently being used for in each of the villages, as well as future projects for the Roseau Valley. “We are speaking here about, in Cochrane 11.1 million dollars work ongoing. Wotten Waven, 3.4 million dollars with the construction of the new bailey bridge and the improvement to the access to the bailey bridge. In Copthall we have spent $3 million dollars with more to come. The excavation currently ongoing in Morne Proper costs 3.8 million dollars. And in Laudat 1.6 million dollars just for one intervention,” Mr. Skerrit added.